SCIENTISTS in China have created genetically modified cows that produce ”human” milk. 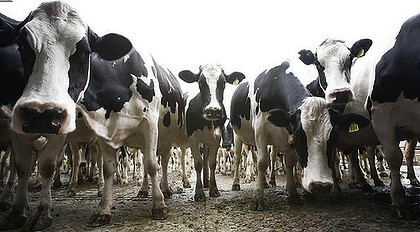 They successfully introduced human genes into 200 cows to produce milk with the same properties as human breast milk. Human milk contains high quantities of nutrients that can help boost the immune system of babies. The scientists behind the research believe that milk from herds of genetically modified cows can provide an alternative to human breast milk and formula milk for babies, which is often criticised as being an inferior substitute. They said genetically modified dairy products from herds of similar cows could be sold in supermarkets and the research has the backing of a big biotechnology company. British scientists said it had the potential to be of huge benefit, but the work is likely to inflame opposition to genetically modified foods. Critics of the technology and animal welfare groups reacted angrily to the research, questioning the safety of milk from genetically modified animals and its effect on the cattle’s health. Professor Ning Li, the scientist who led the research and the director of the State Key Laboratory for AgroBiotechnology at the China Agricultural University, insisted that the genetically modified milk would be as safe to drink as milk from ordinary cows. The rules on research into genetically modified food are more relaxed in China than in Europe and its scientists are leading the way in the field. The researchers used cloning technology to introduce human genes into the DNA of cows before the genetically modified embryos were implanted. Writing in the journal Public Library of Science One, the researchers said they were able to create cows that produced milk containing a human protein called lysozyme, which is found in large quantities in human breast milk and helps to protect infants from bacterial infections. The director of GeneWatch UK, Helen Wallace, said: ”We have major concerns about this research. There are welfare issues with genetically modified animals as you get high numbers of stillbirths. A spokesman for the RSPCA said the organisation was ”extremely concerned”. This entry was posted on Monday, April 4th, 2011 at 10:11 am and is filed under ANIMALS & STOCK, Cattle, FOOD DRINK. You can follow any responses to this entry through the RSS 2.0 feed. You can leave a response, or trackback from your own site. Created by miloIIIIVII | Log in | 81 queries. 29.936 seconds. | Entries RSS | Comments RSS.